George Morris demonstrates leg to hand and straightness of the horse on Hunter Holloway's mount VDL Bravo S, owned by Hays Investments and Virginia Bartholomay. 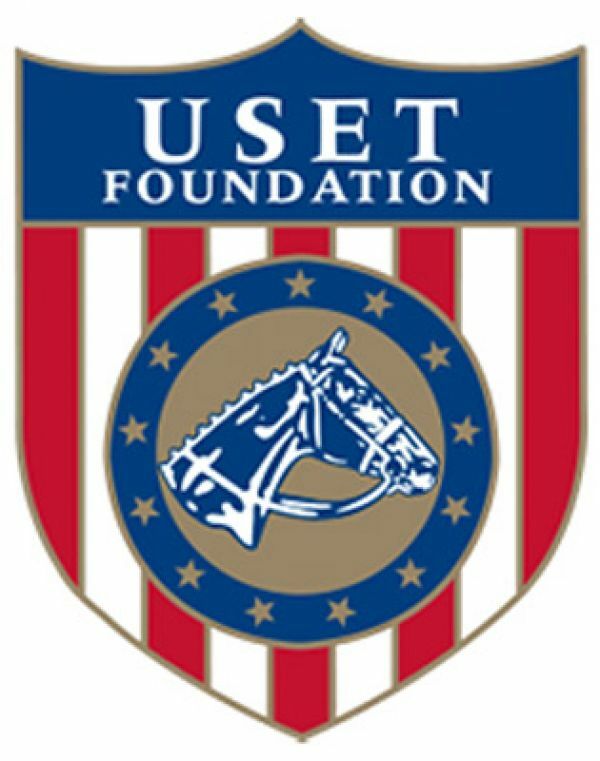 Antioch, IL - June 15, 2015 - Day One of the United States Equestrian Team Foundation's George H. Morris "Gladstone Program" at Annali-Brookwood Farm, organized by Diane Carney, began with a session of flat work. Heavy rains caused the sessions to be indoors today, but Rush and Caroline Weeden's Farm had no trouble accommodating with their beautiful facility and roomy indoor arena. With the program's barn manager, renowned hunter rider Jennifer Alfano and Olympian Anne Kursinski watching over, the opening group mounted up for the first lesson of the week. Hunter Holloway, Morgan Dickerson, Kelly Smith and Michael Tokaruk were the first group, hand selected by Morris, to practice impulsion and straightness. Morris talked about the steps to make a good horse. The first step starts in the barn, care of the horse is of the utmost importance along with correct tack. If the horse is properly cared for, it will be a good horse. Second is the flat work followed by gymnastics. Together, it will make a good horse Morris emphasized. Morris demonstrated leg to hand and straightness of the horse using Hunter Holloway's horse VDL Bravo S. "We can teach you but you have to get it," said Morris..
Group 2 then had their chance to practice their flat work. Liz Atkins, Serah Vogus, Ariel Black, Brandie Holloway and Caroline McLeese reviewed correct position of the rider and effective aids. Morris demonstrated getting the horse to stretch the neck by working the hind end effectively, using Liz Atkins' mount, Carletta. "Every day you get up and you know nothing," said Morris. "After 70 years, I'm just starting to get it." He encouraged riders to read books and learn from other experts. Anne Kursinski was next to perform proper schooling of a horse on the flat. Kursinski not only demonstrated the principles of leg and hand, but she provided inspiration to the aspiring riders. "You have to work at it," said Kursinski. "I wish kids could get that. Jimmy Williams used to tell me I'd never be any good. It wasn't until my third Olympics that he thought I was maybe starting to learn." Kursinski added, "Everyday, I'm so thankful to have horses in my life and what they have taught me and the places they have taken me. They took me to the Olympics and Europe and so much more." She continued to stress to the riders to work hard and learn how to care for their horses with the help of good instructors, your vets, and farriers. "It's what you learn after you know it all that counts," summarized Kursinski. Dr. Deb Bennett from California conducted the afternoon presentation. She is known internationally for her scientific approach to conformation analysis and has made a career out of conveying a kind of "X-ray vision" for bone structure to breeders and buyers. Her background in biomechanics helps her clearly explain how conformation relates to performance ability. Dr. Bennett is the author of "Principles of Conformation Analysis". Dr. Bennett gave a hands on demonstration using a model of the bones of the horse, provided by Dr. Mark Cassells of Homestead Veterinary Clinic, to discuss conformation and biomechanics. Riders had the opportunity to figure out how to put the neck bones of a horse together to see how it functions. Dr. Deb Bennett talked about how conformation relates to performance ability. Dr. Bennett explained the top line of the horse is developed best by contraction and release. She recommended riders change up the exercises and ride off the rail to get the best results. She then focused on the pelvis of the horse to teach riders how to best help their horses by understanding the anatomy. Dr. Bennett explained collection as the process of coiling the loins and raising the center of the horse's back to finally raise the base of the neck producing correct form. Riders then got to see the theories in action as Dr. Bennett used a horse to explain the anatomy and movement of the horse. The group then set the jumps for tomorrow's gymnastics and moved back to the barn to feed and complete their day with Jennifer Alfano, who provided them tips on care of the horse. Day two for the group will consist of flat work and gymnastics along with more from Dr. Bennett.